Complementary to Alex's article on ice sailing in Extreme Sailing, I researched it's history and came to the origins, 1800 BC in Egypt. A Pharaoh then let himself build a sailing vehicle on wheels with which he could be driven along the banks of the Nile. 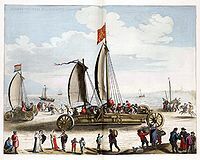 There are some vague records of the use of such vehicles in China, Russia and by the Vikings, and a "modern" type was built (1649) by Simon Stevin in Holland, the first patented design in history. It could carry 30 passengers with a speed of 27 miles an hour along the beach, an unbelievable speed at that time (see title-picture). The most modern type is the beachracer, of which I'll put a video in SailTube. The history of ice sailing is not recorded until the late Middle Ages; but we can be reasonably sure that, again in the Friesian parts of Germany and the Netherlands (an outstretched boggy area without roads), where skating was a normal way of transport in winter anyway, someone must have had the idea to mount skates beneath a small sailing boat. You can see a picture of a late-19th. century of such a contraption on: http://www.geheugenvannederland.nl/?/en/items/ZZM01:F021376/&p=1&i=5&st=ijszeilen&sc=%28ijszeilen%29/&wst=ijszeilen.